A great empire builds great roads. China by that metric is almost certainly great – pick a road that shows as dirt on Google imagery from 2016, and like as not by now it’s been paved, or is in the process of being so. This holds true even in this far corner of Yunnan, vastly closer to Burma than Beijing. The roadside as I wind panting up the mountain outside Habacun on day three, switchbacks pitching drunkenly back and forth, is gouged and scarred by countless gravel quarries and ad-hoc road construction camps dug straight from the living hillside. In that manner peculiar to China the roads themselves and the raw structures that rise periodically beside them throughout the miles seem poised on some razor’s edge between spanking-new and falling-utterly-into-ruin. I pass endless sporadic collections of construction detritus: piles of cinderblocks and tangles of rebar, dark irregular rough-cut planks spilled like toothpicks. Cement trucks rumbling uphill in low gear, spewing exhaust. Another great leap forward, but into what? At the end of the first day’s ride, the high sharp snowcapped teeth of the mountains looming all day to the west as I wind on goat-haunted roads thru terraced fields, the road finally crests, and on my thankful tired legs I swoop 30km down down down the mountain to Daju. In Daju, the Tiger Leaping Gorge Hotel: a dark concrete room with two hard dusty single beds. Strip and shower in a bare concrete block, a hose with weak warm water, the proprietress's toothbrush and just-washed underwear on a low wooden bench in the cubicle. Outside in the dusk a dog lies in the dust of the empty street and the shop on the tiny main square sells only the barest dry goods. The mountains are high and brown and beautiful all around and the town feels entirely left behind. Rural China, an afterthought. I am warned against drinking the water. I think: what to make of a nation that can build bullet trains and six-lane expressways and send taikonauts to outer space, but can't provide clean water for its people to drink? And then I think: is it so different from my country of birth, with its grand bellicose ideas and poisoned water in Flint and West Virginia? We no longer even build things. Leaving Daju I ferry across the muddy Jinsha River and, climbing, skirt the mountain on a single-lane poured-concrete backroad thru tiny villages. Great views, sheer drops; no guardrails. Muscle fibres utterly burnt, beside the bike and pushing uphill for an hour or more. It isn't the long climbs that kill you, it's the steep ones. Evening, morning, sleep and wake, more climbs, more descents, more villages. Off a long winding ascent I emerge into a spread-out hamlet in the winding crease of a beautiful, incredibly steep-sided valley beneath high mountains. The fences and buildings are mostly rough dark split wood, but dozens of unfinished, obviously centrally-planned two-storey cinderblock dwellings stand in rows like sentinels down the centre of the valley. At the roadside, an old man squats in a Mao-era blue suit and cap, a cigarette in his lips as he pokes at trash burning in the gutter. 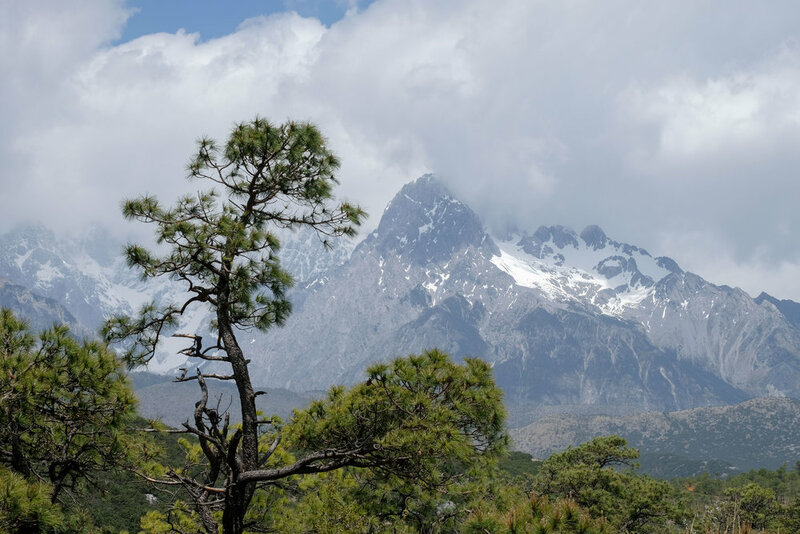 I camp hidden high above another village 20km beyond, the hillside covered in trees bursting with pink flowers and conifers draped in some kind of dust-green Spanish moss, the smell warm and dry and piney like the Sierra Nevada. One more day, spinning, and I reemerge into modern China. The city of Zhongdian beneath grey skies feels half deserted, the shopfronts and guesthouses of the old town half shuttered and the streets outside this small quarter again on that razor’s edge between half-built and half-razed. Huge armoured police vans rove Changzheng Rd, all part of a harmonious society. The Yunnan Airline Aviation Sightseeing Hotel, a vast blocky Brutalist edifice, stands empty, dust and debris choking the revolving door at its entrance. At my guesthouse in the old town this morning, a Taiwanese guy readies his mountain bike for a 13-day ride around the pilgrimage circuit at Khawa Karpo, camping gear and food lashed to a small trailer behind his bike. I wish him safe journeys and he gives me a little hug. 'I'm kind of scared,' he says, and I tell him that it's normal; I'm scared too and it will all be fine. Just start riding. But the fact is that for all the photos of mountain vistas and the romance of the way-out, this riding out into the unknown really does fill me with both fear and intense resistance. The next leg to Litang, which I estimate will take nine days, will take me onto rough roads on the Tibetan Plateau above 4500m. It would be easier to simply stay in town, sleeping in and drinking coffee.